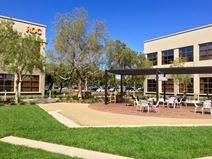 This three-acre technology campus in Irvine, CA provides co-working and commercial spaces ideal for creative and tech companies. There is also a great outdoor space, weekly events and an on-site café. All membership includes free attendance for community hosted events, 24/7 office access, conference room access, business mailing + mailing address, access to phone rooms, kitchen + lounge + Park access, complimentary coffee and printing + scanning + copying. This centre is located right in the centre of Irvine close to all the amenities and easy freeway access is offering great deals on modern and refurbished offices in this Grade A business centre. Great starting business packages available with significant flexibility for all types of occupying clients as standard. The regional transportation services are also excellent and make the center easily accessible. This exquisitely furnished and fully functional Irvine business center is conveniently located close to all major freeways comes with a host of exceptional corporate facilities including a wide range of modern office suites, conference facilities, great network access and on-site security support as standard for all tenants. This vibrant corporate location is situated very close to San Diego and the region's best transport connections. This space occupies a stellar central location and is surrounded by plenty of food and attractions. The days of cubical isolation, dress codes, and information hoarding are in the past. Beyond co-working, at this space, we are co-creating. The future is young, stimulating, and fast, and we work as a community to make positive change. The regional transport links within this vibrant and commercially focused district are excellent. 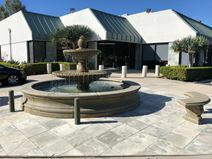 This Irvine business center offers an exclusive business setting offering a range of office amenities and that is inexpensive for the individual in concern. There are also flexible lease terms and conditions that is applicable depending on the of the rental period taken. This service center offers everything needed for the business minded person. Rental serviced space located at a very desirable location in Irvine close to the Entertainment Complex. This centre comes equipped with well appointed and functional offices, boasting state of the art technology and other facilities. This centre close to the Airport with nearby road access to the 733 and 133 Toll Roads. . The building comes with great views, and well appointed office suites hosting excellent network access, with different lease options. This gateway Towers business centre offers is located very conveniently to lots of nearby amenities and to major freeways. Located at the Irvine Business complex. Offers views over Newport Beach. 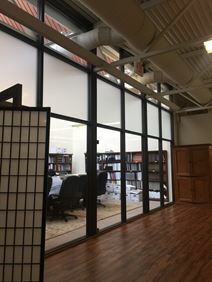 This grand warehouse space aims to offer clients with a large, open layout that can be customized to fit business needs. Amenities comes included in the pricing options, ensuring that additional fees will not be added. Located nearby many local transportation stations, restaurants and after work activities. Traveling to this center is made easy with access to Interstate 405 and California State Route 55. Being just a block from John Wayne Airport this three-floor business center in Irvine is very convenient for travel. The 81 newly renovated offices range from 107 to 1,000 sq. ft. and are suitable for one to five people in need of turn-key office space. The regional transport links in the area area also excellent, with an extensive variety of frequent and convenient services in operation throughout the locality. Special deals available in Irvine close to John Wayne Airport. Great City views and high end mahogany furniture provided, and State of the art corporate furnishings. Good packages on offer. Close to South Coast Plaza and many freeways but set within a quiet environment and a large green space to the back of the office this center offers large offices, open creative and collaborative space and a conference room from a large industrial building with high ceilings in the heart of Irvine. 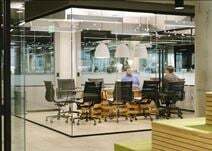 Based in a beautiful glass tower this modern and collaborative workspace is dog-friendly and occupies the 3rd and 4th floors to provide beautiful views of the city. A diverse business and creative area surrounded by entertainment outlets and fantastic transport links. The regional transport services are also excellent and offer tenants with convenient travel options throughout the locality and beyond. Businesses from the IT, automotive and finance sectors are popular in this growing area of Orange County with great access to the 5 and 405 freeways. A mixture of co-working and private office space is available on the fourth floor of this 15-story Grade A building. The regional transport links are highly convenient and offer tenants with a wide range of services in operation throughout the area, making the site easily accessible for all. This center is located on a 20-acre campus with wonderful landscaping and is perfect for a business of any size. Close to shopping, dining, hotels and more, this center provides high quality office space, along with a full range of business support services. Office suites situated in this upscale location within easy reach to a number of shopping and dining amenities with lots of high end hotels nearby. This complex feature modern and well designed office suites with the added prestige of a fantastic office location, making this one of the best in Orange County. The regional transport links are also excellent and offer a range of convenient services throughout the area. Rental serviced space is now being offered close to all local amenities and to the Airport. This centre is offering specials deals at the moment with well designed and modern office suites hosting the latest technology at great business rates. This technologically innovative and state of the art contemporary business hub is situated within very close proximity to John Wayne Airport and I-405 making it a fantastic and ideal location for both international or interstate businesses looking to take advantage of the area"s rich talent pool. The office tower itself provides a choice of co-working areas and flexible fully furnished executive suites. This excellent office space offers easy access to world class shopping, entertainment, hotels and more. This is a dynamic business location offering tenants a unique workplace solution.